Okay, maybe not exactly the pose, but he's getting close! Jamie Nichols plays Houdini in a new UK stage production, Houdini, also starring Stuart Brennan as Theo and Evanna Lynch as Bess. I had the great pleasure of talking with Jamie yesterday via Skype, and he tells me he and his fellow cast members occasionally cruise this blog for research -- which is a real honor. From what he shared, it sounds like this production is going to be excellent! 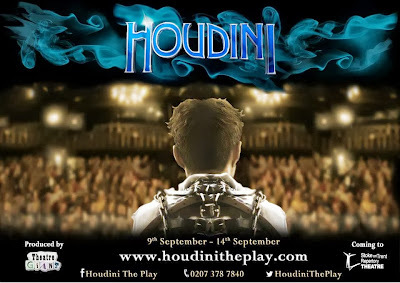 Houdini is set to open at the Stoke-on-Trent Rep Theatre on September 9, 2013. Visit houdinitheplay.com for tour details and to book tickets. New Italian Houdini DVD è bello! Who-dini audiobook available in U.S.
BBC: The new Doctor is "Houdini"